Get pancakes with a purpose Tuesday. 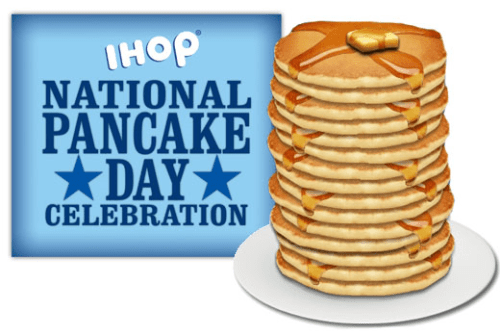 IHOP’s 13th annual National Pancake Day is Feb. 27 from 7 a.m. to 7 p.m. and participating restaurants are giving away free short stacks of buttermilk pancakes. The dine-in only deal is limited to one short stack per person while supplies last. A short stack of three pancakes usually costs $5.79. Although the pancakes are free, IHOP hopes customers will “make every stack count” by donating to charity partners, Children’s Miracle Network Hospitals, the Leukemia & Lymphoma Society and Shriners Hospitals for Children.